Note: If the current version of firmware in your ClearNav is v22 then do not try to update beyond that version. Instead it needs to be returned to the factory for updates to bring the unit up to IGC standards. There is no charge ... see the service page for contact information. 1. Download and unzip (extract) the folder. 2. Open the folder--you will find eight (8) items. 3. Put these 8 items onto a blank memory stick (stick size cannot be greater than 4GB). 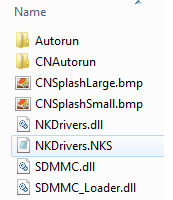 DO NOT put the folder onto the memory stick ONLY the 8 items inside the folder. 4. Remove memory stick from PC. 6. Plug the memory stick into the CN and wait until you are prompted to remove the stick. 7. Remove the stick and restart the ClearNav. You are done! Boot the CN….Go To: Menu > Personal Preferences > Waypoints > then unload your waypoint database………unloading the database decreases the boot time of the instrument and will allow you to successfully install the new firmware. Don’t forget to re-load your waypoints after you have completed the firmware upgrade.